This project earned the name Murphy's Table in honor of the cynical law of the same name. For some unfathomable reason, any measurement and any cut that could be wrong managed to be so. Having a few of these crop up in a project is pretty common but this concentration of screwups is rare. In any case I managed to finish it up and cover my trail pretty well at least as long as no close inspections or measurements are done on it. All visible wood is local cherry with some poplar and hard maple in secondary positions. The mortise-and-tenon joints between the legs and rails are pegged in cherry. 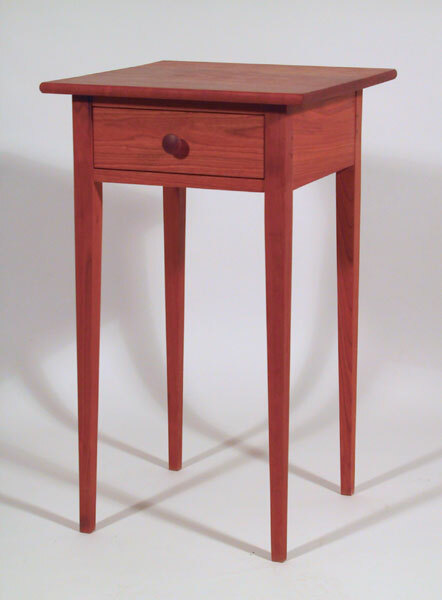 The drawer is dovetailed front and rear and has a solid poplar bottom. Finish is tung oil and wax. Size in inches: 16 X 16 X 27.